Rebecca Hart at the 2014 Alltech FEI World Equestrian Games. Photos (C) SusanJStickle.com. Mulhouse, France – June 30, 2015 – Mulhouse CPEDI3* concluded on Sunday, June 21, 2015, with the Para-Equestrian Dressage Freestyle Tests. All three U.S. Para-Dressage athletes qualified for the exciting Freestyle Tests including Annie Peavy, Rebecca Hart, and Deborah Stanitski. The Mulhouse, France CPEDI3* was scheduled June 18-21, 2015 with the Team Test on Friday, June 19, followed by the Individual Test on June 20, and the Freestyle Test on June 21. The Mulhouse CPEDI3* Ground Jury includes Kathy Amos-Jacob (FRA) 4*, Jan Holger Holtschmit (GER) 4*, Sarah Leitch (GBR) 5*, Eva Maria Bachinger (AUT) 5*, Sarah Rodger (GBR) 5*, Jose Baud (FRA) 4*, Marco Orsini (GER) 5*, and Genevieve Pfister (SUI) 3*. These riders will stay in Europe where they will compete at the Iberherrn, Germany CPEDI3*, scheduled July 2-5, 2015. Rebecca Hart of Unionville, Penn. and Schroeter’s Romani was consistent in her tests in Mulhouse maintaining the 3rd place position in Grade II. The duo scored a 71.9% in their Freestyle Test on Sunday. Hart owns Schroeter’s Romani in conjunction with Margaret Duprey, Cherry Knoll Farm, Sycamore Station Equine Division, Barbara Summer, The Ruffolos, and Will and Sandy Kimmel. Lauren Barwick of Canada and Off to Paris took the blue ribbon with a 72.5%. Heather Blitz was not only the appointed Chef d’Equipe for Mulhouse CPEDI3* but she is also the coach of Grade III athlete and 2014 World Equestrian Games individual Annie Peavy. Peavy had three great days with both her horses, Trakehner gelding Ozzy Cooper the Hanoverian horse Lancelot Warrior. Peavy is also a Young Rider eligible for the inaugural 2015 North American Junior Young Rider Para-Dressage Championships but will stay in Europe to compete in Germany this summer. Over the past three days Peavy, Lancelot Warrior and Ozzy Cooper have maintained strong scores in Grade III. Peavy finished the show with a smooth Grade III Freestyle Test. Hart has been a great mentor for newer Para-Dressage rider Deborah Stanitski who is riding her horse Biara G and has coach Lauren Palmer by her side. The Freestyle Test was Stanitski’s first time showcasing the test with Biara G.
U.S. Riders will head to Iberherrn, Germany CPEDI3* next to compete from July 2-5, 2015. On June 2, is the FEI jog, followed by the Team Test on June 3, the Individual Test on June 4, and the Freestyle competition on June 5, 2015. For more information about the Mulhouse CPEDI3*, please visit: http://www.shm-waldeck.fr. Left to Right – Rider Deborah Stanitski with ribbon and trainer Lauren Palmer; Rebecca Hart (sitting) with Todd Flettrich; and Annie Peavy with Heather Blitz. Photo By: Rebecca Reno. The Mulhouse CPEDI3* Ground Jury included Kathy Amos-Jacob (FRA) 4*, Jan Holger Holtschmit (GER) 4*, Sarah Leitch (GBR) 5*, Eva Maria Bachinger (AUT) 5*, Sarah Rodger (GBR) 5*, Jose Baud (FRA) 4*, Marco Orsini (GER) 5*, and Genevieve Pfister (SUI) 3*. For more information about the Mulhouse CPEDI3* please visit, http://www.shm-waldeck.fr. For more information on Cherry Knoll Farm and Rebecca Hart, please visit www.CherryKnollFarmInc.com. 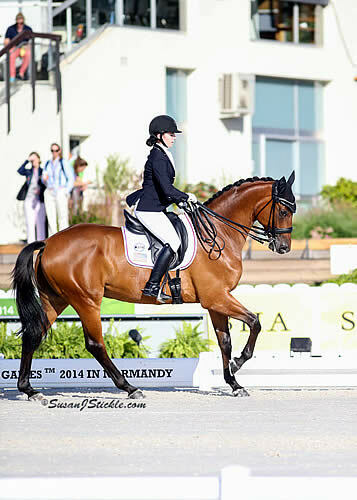 Rebecca Hart and Schroeter’s Romani at the 2015 Adequan Global Dressage Festival CPEDI3*. Photo (C) Lindsay Y. McCall. Mulhouse, France – June 20, 2015 – It was the second day of competition for the three U.S. Para-dressage riders competing at the Mulhouse, France CPEDI3*. Equestrians include Annie Peavy with horses Lancelot Warrior and Ozzy Cooper and coach Heather Blitz; Rebecca Hart and Schroeter’s Romani with coach Todd Flettrich; and Deborah Stanitski and Biara G with coach Lauren Palmer. These athletes traveled to Europe to compete in both the Mulhouse, France CPEDI3* scheduled June 18-21, 2015 and the Iberherrn, Germany CPEDI3*, scheduled July 2-5, 2015. The Mulhouse CPEDI3* began with the Team Test on Friday, June 19, followed by the Individual Test on June 20, and the Freestyle Test on June 21. The Mulhouse CPEDI3* Ground Jury includes Kathy Amos-Jacob (FRA) 4*, Jan Holger Holtschmit (GER) 4*, Sarah Leitch (GBR) 5*, Eva Maria Bachinger (AUT) 5*, Sarah Rodger (GBR) 5*, Jose Baud (FRA) 4*, Marco Orsini (GER) 5*, and Genevieve Pfister (SUI) 3*. The U.S. Para-Equestrians enjoyed a second day of feedback from the FEI Ground Jury and Rebecca Hart earned a consecutive third place finish in Grade II. Peavy maintained her scores in Grade III with both horses and Stanitski followed suit with Biara G in Grade II. Two-time Paralympian (2008, 2012), two-time World Equestrian Games athlete (2010, 2014), and six -time USEF Para-Equestrian Dressage National Champion Rebecca Hart (Grade II) with Schroeter’s Romani (owned by Hart in conjunction with Margaret Duprey, Cherry Knoll Farm, Sycamore Station Equine Division, Barbara Summer, The Ruffolos, and Will and Sandy Kimmel) earned another third place ribbon in the Individual Test, with a 68.371%. Rider Deborah Stanitski scored a 63.457 and the first place duo of Grade II, Barbara Minneci and horse Barilla from Belgium, earned a 70.2% and Lauren Barwick and Off to Paris earned a 68.429% for second place. Grade III, 2014 World Equestrian Games individual, Angela Peavy and her Trakehner gelding Ozzy Cooper earned a sixth place ribbon with a 67.854%. Hanoverian horse Lancelot Warrior earned a 66.878%. First place went to Roberta Sheffield and Double Agent from Canada with a 70.805. Left to Right: Rider Deborah Stanitski with ribbon and trainer Lauren Palmer; Rebecca Hart (sitting) with Todd Flettrich; and Annie Peavy with Heather Blitz. Mulhouse, France – June 19, 2015 – U.S. Para-Dressage individuals Annie Peavy, Rebecca Hart, and Deborah Stanitski completed the first day of Team Tests at the Mulhouse, France CPEDI3*. These three riders and four horses traveled to Europe to compete in both the Mulhouse, France CPEDI3* scheduled June 18-21, 2015 and the Iberherrn, Germany CPEDI3*, scheduled July 2-5, 2015. The Mulhouse CPEDI3* began with the Team Test on Friday, June 19, followed by the Individual Test on June 20, and the Freestyle Test on June 21. The Mulhouse CPEDI3* Ground Jury includes Kathy Amos-Jacob 4*, Jan Holger Holtschmit 4*, Eva Maria Bachinger 5*, Sarah Rodger 5*, and Genevieve Pfister 3*. The U.S. riders are using this opportunity to compete against the best Para-Dressage riders in the world and receive quality feedback from the FEI ground jury.